This is a toy that can make your hands look tiny to others. Made from plastic, these are two tiny hands having sticks at the end near the arm. These sticks are there to hold the tiny hands with your real hands and the real hands will remain hided into your full sleeves. Wearing full sleeve shirt is important for this trick to work. The trick is to show people that you really have only tiny hands instead of the usual size hands. You simply hide your real hands into the full sleeve and from within your full sleeve, you hold these tiny hands with your real hands. This way only tiny hands will be visible outside the sleeves and it will look unusual and funny to others. Loose sleeves will work much better than the tight sleeves. But basically its only for fun for children but at first sight things look quite realistic. Also, since you are holding the tiny fake hands with your real hands, it won't be difficult to perform different actions even with the tiny hands. You can even beat someone with those tiny hands because it would be something similar to beating someone with a stick in your real hands. Here is a nice demonstration of the product in this cool youtube video. 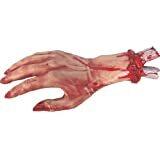 This is another great fake hand toy to frighten someone at night. First of all it looks quite realistic and infect it looks more realistic than the tiny toy mentioned above in no.1. It will be hardly possible for anyone to recognize this as fake hand because it looks almost perfect as a real hand. This is also good to scare someone at night because the hand is blooded and nails on fingers are quite big and red in color. Criminals, ghosts and demons can only have such blooded hands. If you are playing the character of a ghost in any school drama, than this kind of hand will work great to create fear scenes in the drama or any other short movie. This toy can also be hold with the real hand inside the sleeve but its only a single right hand. This toy is different from the above mentioned two "hand toys" in the sense that it is made of rubber and not plastic. Also it has a long arm while the toys mentioned above are basically hands only. 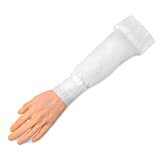 It is quite sturdy and the arm is also covered with a white colored sleeve. It is the left hand of a female and so if you are playing a character in a female role than it could fit best to you. These kind of costumes are generally used in a sleeping role and such a fake hand can be seen lying on a bed or any other type of floor. Of course at home it can be used to frighten others as it looks realistic. Its length is 18 inches and its padded sleeve can be shut in many doors. Just grab it if you need it desperately and it can be bought at Amazon (link mentioned above).